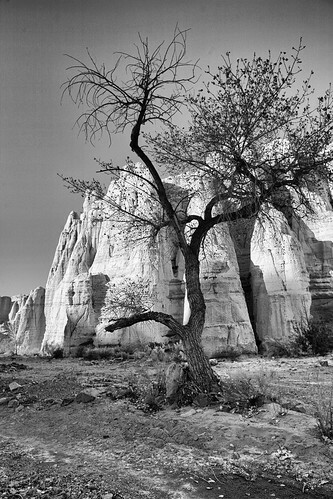 Plaza Blanca, or the ‘white place’, rests protected and guarded in a valley of the Rio Chama hills. 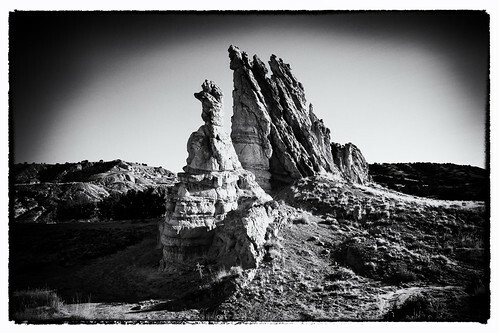 Made famous by a 1940 painting by Georgia O’Keeffe, the sense inside the walls and spires of white sandstone is that it’s been long forgotten; so lonely that it whispers to itself for company. And for the pleasure of an experience like that on a planet with nearly 7 Billion people, the short trek is well worth it. 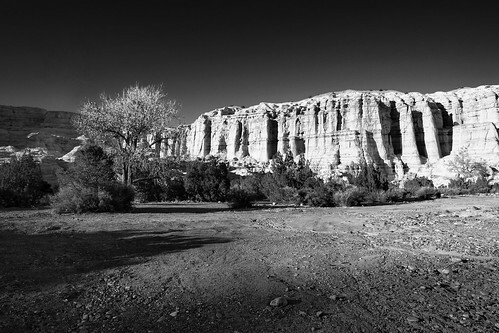 Having hiked in 3 times during the Abiquiu road trip, if you’re wanting to photograph this place, late afternoon presents the most dramatic lighting. 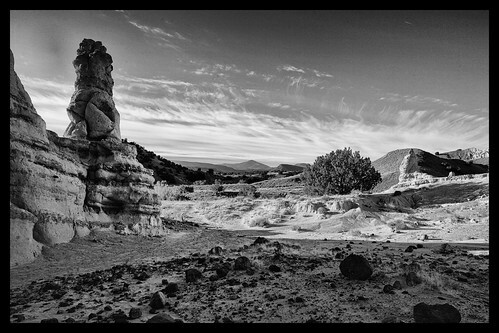 Plaza Blanca, The White Place. Taken at 5:48 pm in November. Plaza Blanca. Taken late in the day, mid November. 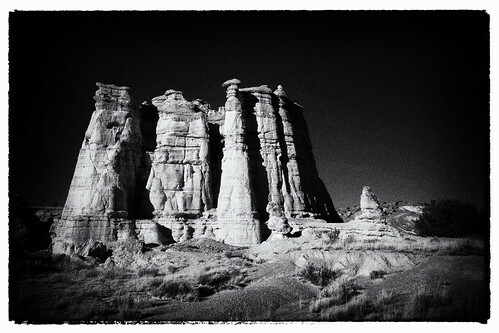 Not that a morning hike can’t yield something worthwhile… they just take a little more work in the darkroom. 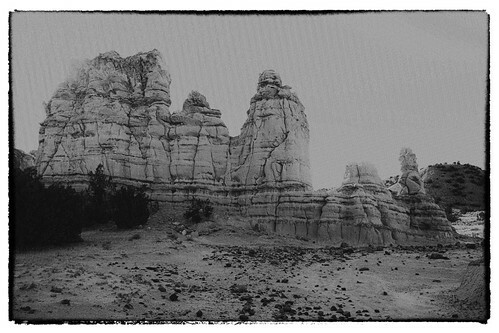 Plaza Blanca in the morning, 9:06 am. Plaza Blanca taken at 8:31 am, mid November. 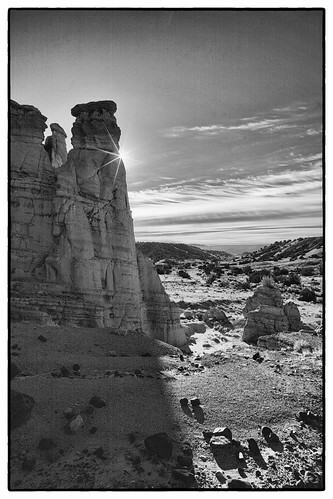 Plaza Blanca in the morning. Now that I see my photos side by side, forget what I said earlier about late afternoon. You can’t go too early or the sun won’t have crested the horizon enough to light the area. Same goes with evening – too late and it’s all shadow. Carry a small backpack and water. Don’t take too much photography gear else you’ll miss the point of the place. Which is something you’ll figure out once in there (the important thing to know is that there IS a point). Me – I thought about dying in there and the tragedy of missing out on another Bode’s green chili cheeseburger but quickly jumped to how hard it is to fix our shortcomings but we can do a darn good job with well placed patches, that my camera gear was a burden, how interesting the miniature spires mimicking the big ones were and that several phallic symbols were prominent, the footprints I keep seeing could be God’s, yikes is that a coyote, look at the rabbit, I need to see the eye doctor when I get home, cursing how hard the rocks are as I lie back while the sun warmed my face and the air tickled my hair, the camera gear forgotten, death replaced by life, tears at the beauty, solitude whispers, the peace and quiet everywhere, including my head. I too stumbled on to the Penitente Morada in Abiquiu. We traveled by truck to see Georgia O’Keefe’s home and a kind woman who lived next to O’Keefe’s home told us of the Penitentes and their Morada up the hill. The tour of Georgia’s home was closed but we saw the outside of the Morada which seemed like a very special place. We, too, felt like we were trespassing when driving in the village of Abiquiu. After researching the Penitentes and Abiquiu when I got home I realized we had indeed been somewhere special. I do want to back and explore the area more. I loved your site. It is rare to stumble upon such a great place (your site). Believe it or not, I was searching for “Brotherhood, NM”. Heading to Abiqui this winter 2012, in just a few weeks! You’ve made a great art. Well-captured and you know how to express the serenity of the place. Black and white color supports its peacefulness. Astonishing! 9:06 and Plaza Peace are my favorites. Nice use of light. Desolate and beautiful. Looks so peaceful! Thanks for the photo do you know the name of the O’Keeffe painting for this spot? What a magnificent place and with your stunning photography, it shouts to me that I should go to hear the whispers! Long has she been a favorite of mine. I see people in the tall spires as well in the smaller ones….holding court or perhaps as sentinels over such a special place. Beautiful descriptions and photos! I’ve seen so many places through your eyes! …”so lonely that it whispers to itself for company”. You’ve intimately captured the joy of that discovery! Beautiful images!